This is the final delivery for our green EOW members. Thank you for joining us this season! We hope you enjoyed the produce and the experience. We will be in touch with a survey in the next few weeks. Oct. 20/21 (this week) – final week for green EOW members. November – Deliveries are available in November for members who signed up for our extension or storage shares. Those already registered should have received a recent confirmation email from us. We still have a few shares available. If interested, go here to sign up. The deadline to register and pay is this Sunday Oct. 23. By mid-November, our coolers will be stuffed with crops to sell through the winter. It’s almost time to begin these harvests. The carrots and other roots are growing happily underground, so we don’t want to interfere yet. We think carrots, in particular, improve in quality if they get a month of cool nights as they mature. 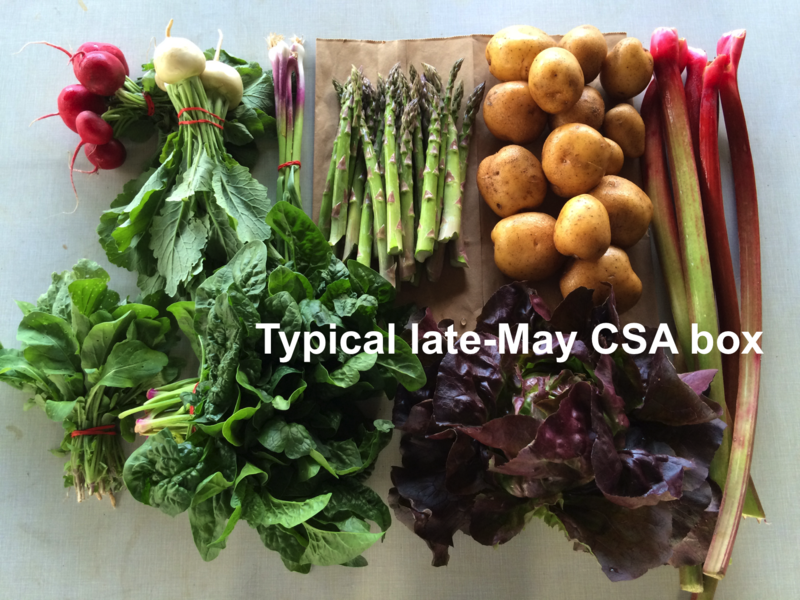 In the meantime, we continue our usual CSA work, as well as preparations for the big upcoming harvests. Steve is making improvements to his carrot harvester, the one we imported from Sweden last year. It is a monster! He loves the thing! It operates best with a team of two or three people but, in a pinch, Steve can run it solo. He beams after a successful run with this machine. Roger patches weak areas on our barn. We plan to paint it next week if the weather holds. Looks like Ireland, doesn’t it? As each crop finishes, we plant the empty field with cover crops. The rye and vetch are in full, lush growth, a beautiful shade of green. 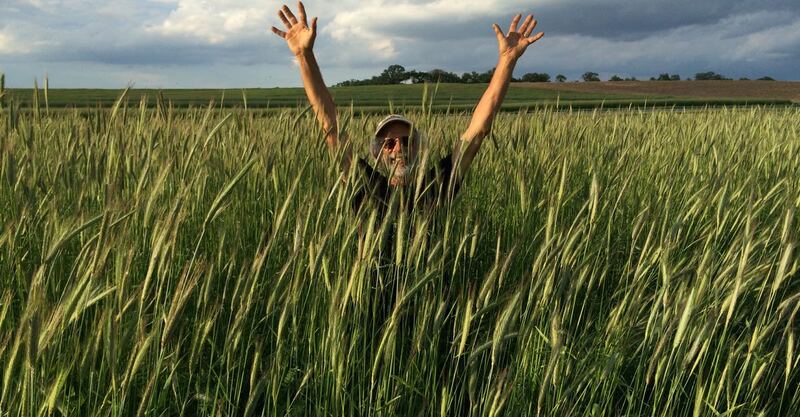 The cover crops keep the soil from eroding over the winter then burst into growth in spring. Maggie and Rebecca harvest kale. We’ve loved the mild weather. No rain, no snow, no mosquitos. Ahh. Matt Schaeffer and Steve check out the remains of Matt’s mulched fields. It’s not too soon to ponder improvements for next year. Steve and I visited neighbor Matt Schaeffer of Sandhill Family Farms to pick up his potatoes for this week’s CSA box. Matt and wife Peg raise organic vegetables about 15 miles south of us. It’s interesting to swap farming notes because they are so close, and grow many of the same crops. Steve and I wanted to see the tomato fields that Matt mulched with a thick layer of straw and hay. It gave him good weed control in a rainy, challenging season. It’s an approach we are considering for next year, so it’s helpful to see it in action on another farm. Who knows, you might get a mix. Butternuts – Like last week, many of the squash we send this week have flaws. Cut the flawed areas away before cooking because they are difficult to recognize once the squash is cooked. The squash are very good cooking quality, worth the bit of extra effort. The plants made beautiful squash before the rainy weather caused problems. We’re packing a mix of different butternut varieties. If you receive a small squash with very dark orange color, that’s the ‘Honeynut’ variety. They are quite small and very tasty, a result of breeding program directed at high quality, ‘single-serving’ squash. They are too small to send on their own, so I will pair it with other small butternuts. Storage: Store at room temperature with good ventilation. Eat soon – these might not store for long. Storage: Can be stored at room temperature or in a cool spot. Keep in the dark so they do not turn green. The Carolas are thin-skinned and prone to drying out, so keep an eye on them. Yukina (large heads of dark green leaves) – This is my favorite fall green. It is nutritious, delicious, a great combination of mustard-like leaves with crunchy stems. These yukina look big, but will shrink once cooked. We usually steam and drain chopped yukina, then dress it with a cooked mixture of fried garlic and ginger simmered with olive oil, balsamic vinegar, soy sauce, a little sugar and a lot of paprika or hot pepper flakes. Poblano chiles (triangular, shiny, green or red) – These are mildly hot. Poblanos are the creme de la creme of chiles. They have lots of great flavor in combination with manageable heat. Steve protected these plants from frost so we would have the chiles for you. Roast and add to soup or casseroles. For our household, they are emblematic of fall cooking. Beauty Heart radishes (round, white with pale green shoulders and bright pink interior) – Refrigerate. The interior color is lovely. Slice thinly and add to salads, cook lightly in mixed vegetable medleys or cut into matchsticks and add to pasta salads. We have sent the Beauty Hearts in combination with carrots because they make lovely, mixed salads, like Lauren’s dish below. Combine radish and carrots in a large bowl. In a small bowl, combine all vinaigrette ingredients. Whisk until well combined and creamy in appearance (this means it has emulsified and will hold together well–mustard helps you achieve this emulsification so don’t leave it out!). Taste and adjust seasonings (some people will like more vinegar, salt or sugar). Pour dressing over radish and carrots. Lay out 3-5 avocado slices on each plate. Top with radish and carrots. Sprinkle with salt and drizzle with any dressing that remains in the bowl. Melt butter in a large stockpot over medium heat. Add leeks along with a couple pinches of salt and pepper. Cook for 10 minutes. Reduce heat to medium low. Add potatoes, butternut squash and a few more pinches of salt and pepper. Cook for 15 minutes until soft, stirring every couple minutes. The bottom of the pan may brown a little, but don’t worry about this. It will just add flavor! In a separate large sauce pan, bring broth to a low simmer. Add rice and stir to combine. Stir for a couple minutes to toast the rice. Add wine and use a wooden spoon to scrape any browned bits off the bottom of the pan. Use a ladle to add a couple spoonfuls of simmering broth to the stockpot. Stir to combine and continue stirring every minute or so to keep it from sticking to the bottom of the pan. The idea is to stir it often enough that it has no chance to stick, but not so frequently that it doesn’t have a chance to simmer. Add sage after first addition of broth. Continue adding ladlefuls of stock every few minutes. You will keep adding and stirring and adding and stirring (slowly) for 30-35 minutes. Taste occasionally to test the texture of the rice. You want it to be cooked but not too mushy at the end. Adjust seasonings as desired.